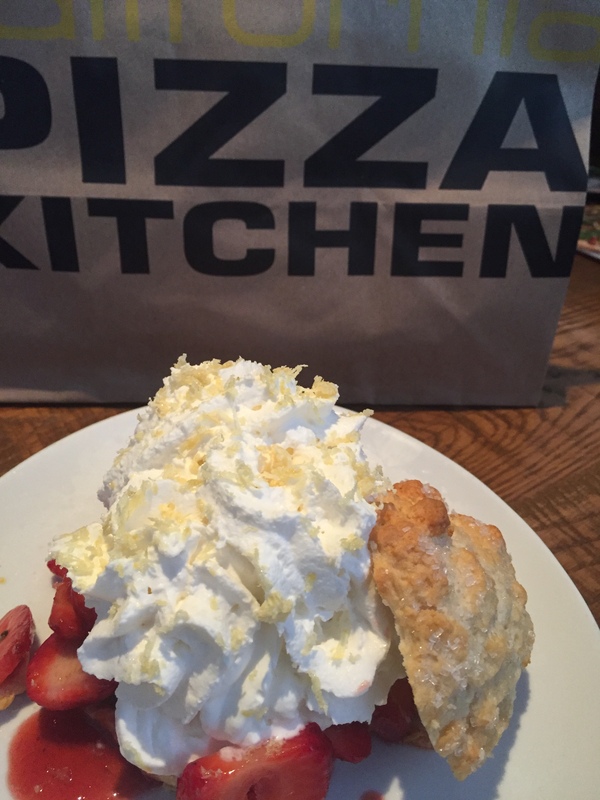 California Pizza Kitchen in Santa Barbara’s Paseo Nuevo is celebrating its 25th anniversary this week and we’ve just been there for lunch. In a few words, it was extraordinarily good. Those of you who haven’t been to CPK in a while will be surprised and delighted. The restaurants have moved beyond delicious signature pizzas and are now cooking gourmet appetizers and main dishes of first class originality and quality. Combine this with their well-known brand of smiling, attentive service, reasonable pricing and guarantee of satisfaction and you have no reason not to eat there. Regularly. 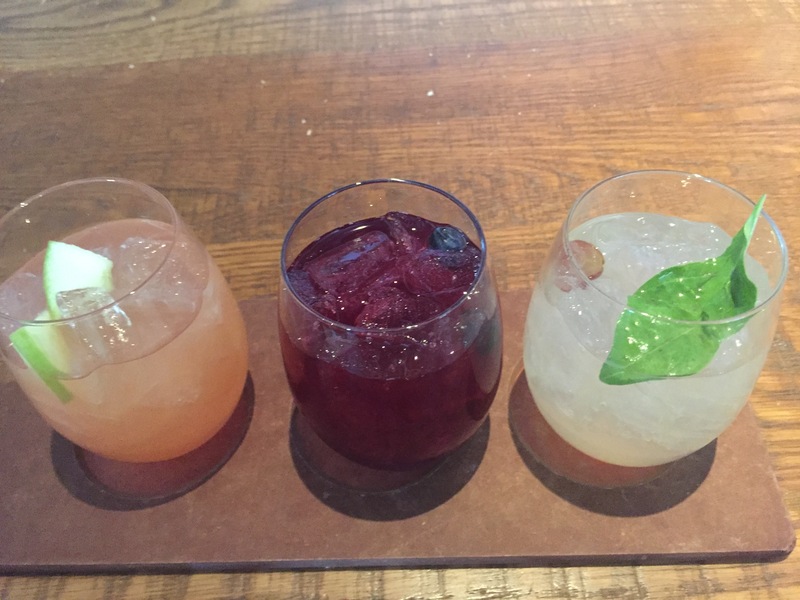 Today we started with a cool lime margarita handcrafted with Casamigos Tequila Blanco, eschewing their clever new flight of three colorful and fragrant sangrias. And we munched on crispy flatbread topped with whipped truffle cream, Gorgonzola, Mozzarella and fresh sage. 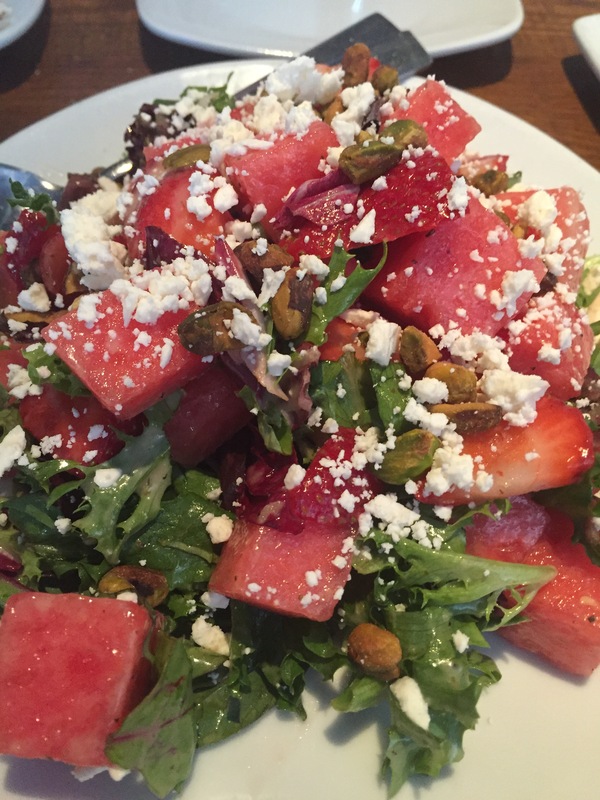 Then we ate a refreshing California Fields Salad chock full of fresh watermelon cubes, juicy strawberries and field greens, enhanced with a house- made vinaigrette, Feta cheese crumbles and California pistachios. A perfect summer starter. A sublime 12-ounce USDA choice ribeye grilled with Pinot Noir sea salt and dressed with creamy blue cheese butter was done to perfection. 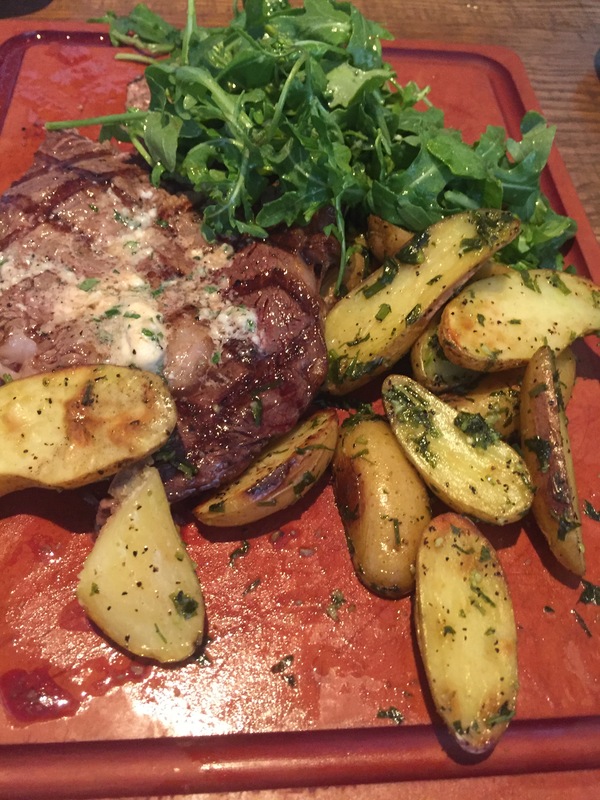 Served with browned fingerling potatoes and lemon garlic wild arugla, this dish a sensation of tastes and textures. We then ate the moistest roasted garlic chicken with seasonal vegetables. 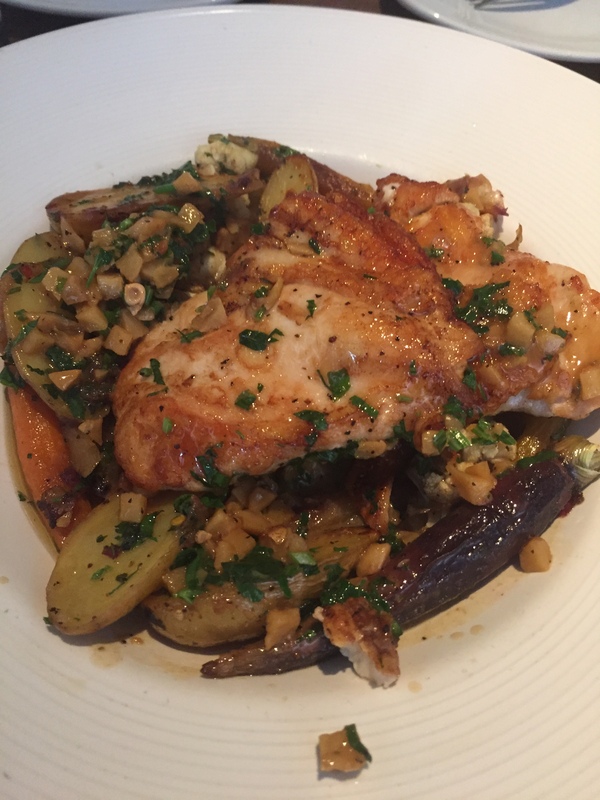 The chef magically pan-sautéed high quality chicken breasts in a tangy lemon-garlic sauce, then plated them with hearth-roasted fingerling potatoes, cauliflower, Mediterranean herbs and seasonal vegetables and, voila, heaven. Both these dishes can be expertly paired with a large selection of wines that CPK now cellars and the staff are quite expert at selecting just the right wine. Our lunch finished on a high note: a beautiful seasonal strawberry shortcake–a fresh shortcake biscuit piled high with fresh strawberries, whipped cream and a house made candied lemon zest. Ours also came with a scoop of rich vanilla ice cream to boot. You must see and taste what CPK is doing. They deserve the highest praise for elevating their cuisine and now, not only do they still offer their legendary pizzas, soups, sandwiches, pastas, salads and appetizers, but they can please the most discriminating of tastes in search of more complex dishes. There is no doubt the Santa Barbara restaurant has worked around-the-clock to create a fabulous new experience for guests. The new environment welcomes patrons with a relaxed, upscale feel and incorporates many natural, soothing elements. By all means we recommend the Santa Barbara CPK for the charming attention of its gentlemanly and professional manager, Kevin Secky. And the superb chefs. And lastly we urge you to ask for Kat, who is a beguiling server whose graceful talents are equal to her adorable good looks.